The general purpose of job analysis is to document the requirements of a job and the work performed. Job and task analysis is performed as a preliminary to successive actions, including to define a job domain, write a job description, create performance appraisals, selection and promotion, training needs assessment, compensation, and organizational analysis/planning. In the fields of (HR) and Industrial Phychology, job analysis is often used to gather information for use in personnel selection, training, classification, and/or compensation. Job analysis can result in a description of common duties, or tasks, performed on the job, as well as descriptions of the knowledge, skills, abilities, and other characteristics (KSAOs) required to perform those tasks. In addition, job analysis can uncover tools and technologies commonly used on the job, working conditions (e.g., a cubicle-based environment, outdoor work), and a variety of other aspects that characterize work performed in the position(s). When used as a precursor to personnel selection (a commonly suggested approach), job analysis should be performed in such a way as to meet the professional and legal guidelines that have been established (e.g., in the U.S., the Uniform Guidelines on Employee Selection Procedures). In the context of vocational rehabilitation, the output of the job analysis is usually evidence. The evidence is used to support a determination regarding the injured worker's vocational choices. In certification testing, the results of the job analysis lead to a document for candidates laying out the specific areas that will be tested (named in various ways, such as the "exam objectives") and to a "content specification" for item writers and other technical members of the exam development team. The content specification outlines the specific content areas of the exam and the percentage of the exam (i.e., the numbers of items) that must be included on the exam from that content area. The purpose of Job Analysis is to establish and document the 'job relatedness' of employment procedures such as training, selection, compensation, and performance appraisal. There are several ways to conduct a job analysis, including: interviews with incumbents and supervisors, questionnaires (structured, open-ended, or both), observation, and gathering background information such as duty statements or classification specifications. In job analysis conducted by HR professionals, it is common to use more than one of these methods. For example, the job analysts may tour the job site and observe workers performing their jobs. During the tour the analyst may collect materials that directly or indirectly indicate required skills (duty statemenets, instructions, safety manuals, quality charts, etc). The analyst may then meet with a group of workers or incumbents. And finally, a survey may be administered. In these cases, job analysts typically are industrial psychologists or have been trained by, and are acting under the supervision of, an industrial psychologist. What Aspects of a Job Are Analyzed? Requirements The knowledges, skills, and abilities (KSA's) required to perform the job. While an incumbent may have higher KSA's than those required for the job, a Job Analysis typically only states the minimum requirements to perform the job. How can we have a view about a job if we have have never seen it in action! Observation is a starting point (data capture) for most job analysis work. Observation works best where activities being performed can be seen and there is a definite sequence. Observation is harder for conceptual/managerial work (not readily open to observation). Observation works best where activities being performed can be seen and there is a definite sequence. We might see things being done but we may not comprehend why they are being done, the knowl-how the person is using, the basis and derivation of the methods they are using or how they feel about their job. Thus observation is harder for conceptual/managerial work. Many aspects of job occupancy and performance are not readily open to observation. Recording process must be designed for reliability reliable. There are problems of subjectivity. interpret results - interpretations of different observers may differ. we might present observation findings to jobholders and seek their interpretations. requires observer preparation and training. observation of someone at work involves permission from the job-holder's and controller of the workplace! we can structure the method by using a task or time-oriented checklist - if we design these! Design means defining categories and construing a model of things we are trying to observe/record. Place yourself where you can see/record everything a jobholder does. Write up your notes/data. This gives an overview but may not go far enough. Is the importance or difficulty task revealled. A wider survey may need to establish such matters. observe tasks/duties being performed. What is done, movements, sequences, information used, contacts, speeds, the environment? Probe to clarify and explain. Arrange a separate time to interview (ask/talk with) the job holder, or their boss or others. talking to the job-holder while they are doing the job is frought. There are problems of concentration, safety, error, continuity and irritation for the job holder. Questions interfere with observation. The method depends on the work. In a analysis of factory workers, noise may limit shop-floor interviews. How can you interview a telephonist? Complete the observations - be non-participant, a fly-on-the wall (but follow proper introductions and courtesies) then carry out the interview in a proper, quieter, uninterruptable spot. Be aware of the job-holder's needs - pressure of work, tension, other priorities. It may be possible to interview a telephone dealer between calls but if calls are flooding in and the tension is high - then the analyst is a nuisance. Here you are interested in behaviour of jobholders rather than tasks they do. Behavioural analysis usually involves pre-determined behavioural criteria and a checklist. Editor - Insert Rackham and Morgan's and Bayles checklists here. Are they meaningful? What relevance do they have for the research task and the people being observed? Can the behaviour be observed reliably? How much interpretation will be required? What will be the problems of interpretation? Are the categories separate and distinct? Is there a relationship between the behaviour being observed and the objective of the work analysis. If not why define such a category to observe? Behavioural analysis requires preparation and knowledge of work processes. For reliability and consistency, all analysts must agree on what each behaviour involves. The behavioural categories should be comprehensive but not so many to make it impossible to observe. Behaviour analysis forms have to be finalised as recording devices. Trained analysts are needed for best objectivity to be secured. We need also to comprehend the whole cycle of activities to guide further depth research. the observer records at set intervals of the activity or behaviour e.g. every minute the observer records what the jobholder is doing. Noting a unit of behaviour as per checklist categories whenever they occur. if quantified, we can chart each type of behaviour and perhaps compare performance between good/less good jobholders. Under this method the job analyst actually performs the jobs under study to obtain a first hand experience of the actual tasks,Physical and social demands and the enviroment of the job. this method is require only for job where skill requirement are low and can,therefore,be learnt quickly and easily. Tell me about your job...? it may involve co-workers with one co-counselling the other from a job analysis viewpoint. A special job analysis is not needed. In all cases preparation is likely and advantageous for the job analysis interview e.g. information on similar jobs or a job description has been considered or the job-holder observed working. The roles and the purposes give structure. The interviewer generally uses a questioning strategy to explore the work the job holder performs. Listening and noting is vital. These enable probe/follow up questions to be posed. The questions and responses - with summaaryies enable the interview to be controlled. The conversation takes on a structure with areas being considered, explored, related to each other and revisited to secure the depth of information required in job analysis. Interpret the information obtained in ways that are not biased and partial. Effective listening requires concentration and this can be disturbed by interruptions, the interviewer['s own thought processes and dificulty in remaining neutral about what is being said. Notes need to be taken without loss of good eye contact. Cues need to be picked up so that further questions can be asked to probe issues and areas of interest. two jobholders are brought together to interview one another about the work that they carry out (co-counselling). They may be asked to undertake a management by objectives analysis or a job evaluation analysis. Care is needed to set up such interactions. A specialist analyst is not involved and participants need to know what they are doing, why and what is expected as a result. They may be intrained as interviewers and not structure the interview as recommended. Notes and records may be needed for subsequent analysis. A structured interview may be akin to a staff appraisal or job evaluation interview carried out by a manager with a subordinate. The manager is the analyst. Interviewing is a flexible method for all levels and types of job. An interview may focus on what a hypothetical job might involve. 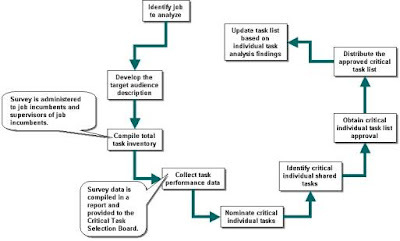 Interviews generate descriptive data and enable job-holders to interpret their activities. A good interviewer can probe sensitive areas in more depth. Structured questionnaires cannot easily do this. Jobholders can give overviews of their work and offer their perceptions and feelings about their job and the environment. Rigid questionnaires tend to be less effective where the more affective aspects of work are concerned. an interview may stress one area and neglect others. Interviewing as the sole method of job analysis in any particular project has disadvantages. Interviews are time consuming and training is needed. Co-counselling may remove the analyst and enable jobholders to discuss work between themselves. Through inexperience however they may miss items and there is the natural problem of people not establishing and maintaining rapport with each other during an interview. In this method a diary and logbook is given to each job holder.The job holder daily records the duties performed marking the at which each task is started and finished. The record so maintainde provides information about the job.This method is time consuming. Moreover, it provides incomplete data becouse information concerning working condition,equipment used and supervisory relationship is not available from the logbook.This method is useful for jobs that are difficult to observe like engineers,Scientists,Research men,Senior Manager etc. If we can record and analyse the components and processes, technical and human, involved in critical incidents that occur in a job, then we may discover new insights about the job. We may be able to design it better, train people for it better or even - from - an scholarly perspective - develop better models against which we can test propositions about work relationships and elements. Critical incident analysis is a common method. A typical approach involves gathering data on observed or narrated incidents reveal important or critical elements of performance. a critical incident is simply one which has occured that the job holder must respond to (performance). It is critical in that it is selected as being the type of event and involving the type of issue or behaviour that you are interested in. The range of incidents could be wide. They could come from a particular narrow band of job events. The incident is observable. We can record its components and examine information about it. Conclusions can be reached about actions, processes, results, consequences etc evident from the incident. We can identify sequences, objects, tools, transactions, sub-events, skills, cues, response times and a myriad of other factors. the incident needs to be an event occuring in a situation where purposes, intentions, activities/actions and effects/consequences can be defined objectively. The recorded incidents are snap-shots in the general flow of events. They are case studies from which we can see the elements of the incident and its performance, how the situation was handled and relationships to other events, conditions and the job as a whole. Why - what are your aims and purposes. The people being observed or asked about critical incidents will want to know the purpose of the research inquiry. Explanations must be absolutely clear and acceptable. Identify observers/recorders (researchers) the type of incidents you are seeking to observe. Just observe for anything is too loose. This is a research problem i.e if you are going to look for incidents - are these real, relevant incidents, could they be made up just because you are watching? The researcher needs to understand the background to the job/work. Those who will be asked about "incidents" need to know the job. The "subjects" will be jobholders or supervisors, people who have a significant interface with the performance of the job..
individual or group interviews - free-form or to a structure. what the person do which was effective or ineffective (actual behaviour observed)? when data on one incident is gathered the interview can continue to gather more incidents. If a "fill in the sheet" approach is being taken the "subject" may complete several of these according to the number of incidents. if a description is full and detailed - does this mean we can place more reliance on its accuracy? how do we analyse the data? What principles should be applied? categorising and classifying the elements of incidents involves subjective judgement. A sample of incidents can be placed into categories or classes e.g. defined by the frame of reference being used. The procedure may reveal that classes overlap or that the class definitions are poorly framed. The class definitions may thus need to be redefined. We may find that an incident involving the same kind of behaviour can be placed into two categories. categories may be simple or too complex. When and Where might Critical Incident Method be used? flexible and suitable for analysis of all types of jobs and arrangements of work. it concentrates on observables, incidents, things have happened. it can contribute data to personnel selection, the ergonomic design of equipment and work spaces e.g. a train drivers cab, warehouse security,training needs analysis and staff development. Critical incident method has value in the job performance appraisal situation. Critical incident data is anecdotal i.e. a story of how someone acted or responded to an event. Obtain observations from more than one person or one group e.g. in a particular area or project. Take to supervisors and other internal and external clients" as well as jobholders. Provided they know the job and have observed "incidents" of performance then cross checking improves the reliability of data and how questions of effective/ineffective, significant/insignificant caan be interpreted. Critical incident analysts need some prior learning about the method and the nature of observations because of the subjectivities involved. This can be readily done and should not present a barrier to the method. Two diferent researchers might for example sort/categorise the same incident data and compare results. Proper procedures It is important that proper procedures are followed. ensure that information on what the person actually did not what they think they did is described in detail. Without this component behaviours/actions cannot be defined and subsequent analysis suffers from generalisation and unreliable data. a large sample of incidents may be needed for a comprehensive analysis.How many would be needed for a senior management job or the job of an airline pilot? one interview is unlikely to reveal more than 4 good incidents in an interview or ten if they complete proformas. This kind of possiility illustrates the time demand of the technique and how impracticalities may loom large. Complete a series of ten interviews. If each identify ten critical behaviours, 100 are avaiable to be classified. A new or modified behavioural classification may be generated. This can then be used for proforma analysis and so lessen the time involved in interview analysis. Critical incident is seldom going to be used on its own. It is interesting for the reseracher and subjects. The data may enable them, through reflection, to explore many facets of job performance. As a "conversational" approach the anecdotes and stories often colourfully reveal the humour, excitment and drama of working life. Some subjects learn the method quickly and may revel in it. This adds to the danger of over-elaboration of anecdotes and the problems of reliability, subjectivity and interpretation. Sometimes people cannot think of relevant incidents or are unwilling to discuss certain types of incident with outsiders e.g. instances of of failure. Confidentiality must be stressed and information on how results are to be used may need to be given. Cited incidents may be ones which tend to reference positives rather than negatives e.g. in performance or in relationships. People may find it easier to narrate incidents that had not gone well. These may be more vivid in recollection. Normal, successful work incidents may be taken for granted and under-stressed. Data from other techniques may provide information on understated aspects of work. the learning and developmental opportunities they offer. expectations, conflicts, ambiguities and tensions manifested. contributions to work systems and information systems. Discussion about job roles, perceptions about roles and role experience involves you in a learning conversation. The content, process and interpretation of the elements of the conversation may contribute to many lines of research. What kind of data/information can be obtained when you analyse a job (e.g. your own) and report on its form, content, problems, performance, delights, loves and tensions? The following questions/headings are a starting point for you to reflect on your job role discuss it with others and - from the notes that you generate - subsequently write your job analysis report for your self-development portfolio. Is the title appropriate/sifficiently explanatory? Does it need a title? What does the title indicate in terms of status, authority - both within your "firm" and to the world in general? How is the job "placed" within the "firm "? How does the grade and salary compare to other jobs both within the " firm " and externally in relation to comparable jobs both within the industry and other industries? What are the comparable jobs? Why are they - legitimately in your view - comparable jobs? Draw an organisation chart for your "firm " and identify your job; its level and position within it. who do you report to in the hierarchy (formally - boss and key others)? who are you responsible (number of full-time and part-time staff and their job titles)? Write brief notes on the significance of the relationships. Why are they significant? How permanent is the job? In what way is this a significant question for you? What are your expectations about permanence? In what way is the job a "job for life "? How wedded to the job are you? If not, why not? How is the job changing or likely to change in terms of permanence? What are the implications for you and "the firm"? What physical mobility is involved with the job? What mental mobility is involved with the job? Yearly - and responsibilities that arise from time to time. Other Key events/points in job cycle that you are responsible for. What would be the indicators if these standards of performance had not been met? What information systems do you use in your job in order to carry out your responsibilities? List them and write a brief explanatory note about them. The information systems can be manual, paper-based or computerised. service the needs of customers? enable the "firm" to obtain efficiency, consistency, cut costs and make better profits? How many transactions do you make (entering, obtaining data) with these information systems each day? Which information systems does your boss and others use to monitor your performance and progress in the job? What would result if these information systems - suddenly were not available? What steps are taken to ensure the security of both the data and the fabric of the information systems themselves? What meetings do you attend and why? Describe each of the meetings. How do formal meetings compare with informal, daay to day interaction in terms of significant decision making and managerial co-ordination? What contributions must you - because of your job responsibilities - bring to these meetings? What personal qualities do you bring to these meetings and the others who attend the meetings? What "decision-making authority" do you have over staff and resources e.g. Even if you do not have formal authority - what influence e.g. by way of expertise/advice, personal qualities - are you still expected to have over others? In each case describe the personal qualities you bring to bear to apply such influence. expenditure on services and consumables? expenditure on other major items? Describe each of these and give details of what, how much etc. Do you have a budgetary recording and monitoring system? Explain this briefly. What are its strengths and weakness? What role ambiguity are you facing? What role incompatibilities do you perceive between yourself (your personal make-up and your role)? What role conflicts are you facing? What is causing these? Why are they conflicts? What role overload are you experiencing? What is causing these? What role underload are you experiencing? What is causing these? What role ensignia do you use/display (both physical and in terms of mannerisms/behaviours)? What strategies are you using to cope with job changes? What strategies are you using to cope with job stresses? What scope for achievement (in areas of certainty and uncertainty) do you have? What are the things that are blocking your potential for achievement at the moment? What scope is there for advancement? What do you think you might do about this? your career in a wider sense? your interests and life commitments in a wider sense?